Eileen Schiesel, 92, sits on a wooden bench outside the Teresian House Center for the Elderly in Albany. 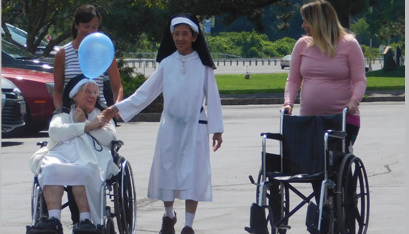 Her walker sports a floating red balloon. When the cue is given, Mrs. Schiesel pulls herself off the bench and heads down to the parking lot. Back in high school, the Teresian House resident was a runner for her school’s track and field team. She’s still getting her steps in every Tuesday morning, thanks to the center’s new Mindful Mile walking program. Mindful Mile is a wellness and quality-of-life initiative sponsored by Sodexo, the food service company that serves Teresian House. 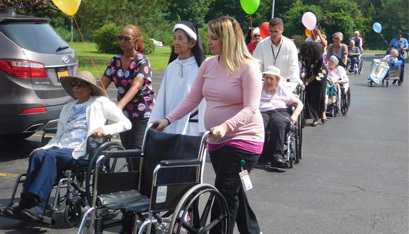 The walking program at the nursing home runs from June through October, with both residents and staff meeting weekly to walk a mile around the grounds of the center. Dawn Chase, clinical nutrition manager at Teresian House, helped implement the Mindful Mile program last year with the assistance of two other dietitians. 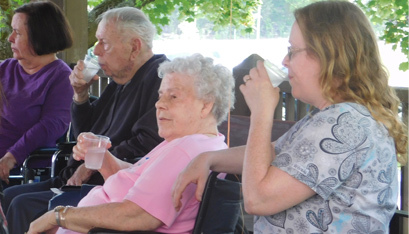 Before one recent walk, one resident waited outside as the group gathered in the lobby. “It’s such a nice day,” she remarked. Another resident, who was assisted in a wheelchair, spent the walk looking at the sky and overarching trees. “Beautiful,” he said to himself. Mrs. Chase said that, in addition to the benefits of being outdoors and getting exercise, the Mindful Mile is an opportunity for socialization. Because residents and staff all live and work on different floors, the walk is a way for everyone to come together. One resident, Felicia (last name withheld for privacy), confirmed that “not only is it good exercise, you get to make new friends. Living in a place like the Teresian House, you can get isolated” unless there’s involvement in group activities. Mrs. Chase helped to design the Mindful Mile walking path, which starts in the lobby of Teresian House, snakes around the front parking lot and ends at a gazebo, where water is served. 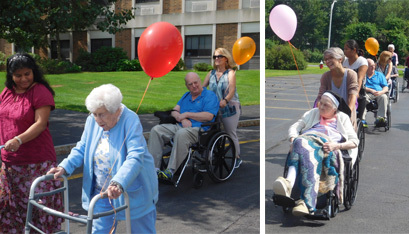 Cones are set up on the designated path as a guide, and balloons are attached to residents’ wheelchairs or walkers as a warning sign for nearby drivers. 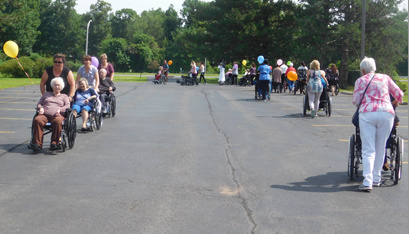 A few residents are able to walk independently, though most are assisted by staff. Even if residents aren’t walking, the benefit of being out in nature has been shown to improve emotional health. In a 2015 study by Gregory Bratman, a graduate student at Stanford University, Mr. Bratman asked volunteers to walk through nature trails on campus and observed how they felt afterward. His study found that the volunteers who walked through lush, green portions of the Stanford campus were more attentive and happier after the walk than those who walked through more urban settings, close to traffic. Rita Sardos, a resident of Teresian House, lived in New York City years ago before moving upstate. She said one reason she looked forward to the move was that she loves the environment in the Albany Diocese. For residents like Mrs. Schiesel who can still make the walk, the Mindful Mile is a great way to get her exercise in for the day. Mrs. Neikam noted that this is important to a number of residents.